Figure 28.8. 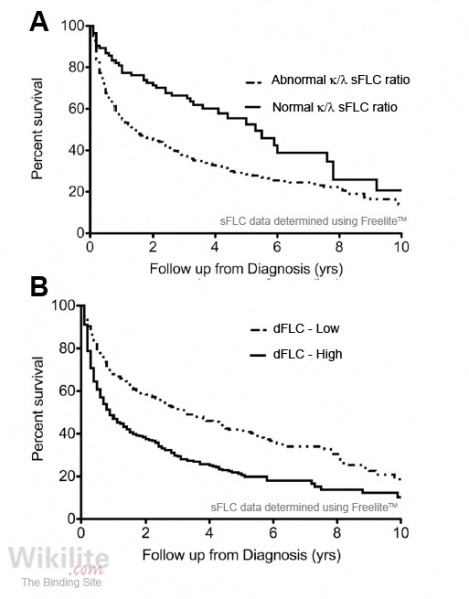 Relationship between overall survival outcome and sFLC measurements at diagnosis. (A) AL amyloidosis patients grouped according to sFLC ratio at baseline (normal versus abnormal). (B) AL amyloidosis patients grouped according to baseline dFLC (high: >196 mg/L vs. low: <196 mg/L). (This research was originally published in Blood ©  the American Society of Hematology). In addition to assessing the degree of organ involvement , evaluation of sFLCs at baseline provides important prognostic information in AL amyloidosis, and is recommended in IMWG guidelines (Section 25.3.1.) . In a study of 730 patients, median overall survival was shorter among those with an abnormal sFLC ratio at baseline (16.2 months, n=644) than in those with a normal ratio (63.6 months, n=86) (Figure 28.8A) . When the analysis was repeated grouping patients according to sFLC burden (defined as the difference between involved [iFLC] and uninvolved FLC [uFLC], dFLC) above or below the median value (196 mg/L), the overall survival for patients with high dFLC was 10.9 months compared with 37.1 months for those with low dFLC (p<0.001) (Figure 28.8B ) . High baseline iFLC or dFLC levels have also been shown to be associated with poor outcome in a number of other studies , including AL amyloidosis patients undergoing stem cell transplant  and a subset of patients without cardiac involvement . In addition, Palladini and colleagues  demonstrated that a high baseline iFLC/uFLC ratio (≥6) predicted a shorter time to second-line treatment, in patients who initially responded to chemotherapy (p=0.027), and Park et al. found a higher risk of thromboembolic events in AL amyloidosis patients with a high dFLC (≥172.4 mg/L) at baseline (p=0.029). Kumar et al. noted that AL amyloidosis patients had a worse survival if there was no intact monoclonal immunoglobulin detectable (12.6 months vs. 29.3 months, p=0.02). The patients without monoclonal heavy chain had a higher dFLC value (255 vs. 153 mg/L, p<0.001) but on multivariate analysis both dFLC and the presence/absence of heavy chain were independently prognostic for survival. Kumar et al. also reported that AL amyloidosis patients with high sFLC burden (dFLC >196 mg/L), had more frequent and severe cardiac involvement, with higher levels of cardiac biomarkers troponin T (cTnT) and pro-B-type natriuretic peptide (NT-ProBNP). However, in a multivariate analysis that included a variety of markers, baseline dFLC remained an independent predictor of survival. In a subsequent publication from the same centre , a revised staging system for AL amyloidosis was proposed incorporating dFLC alongside the cardiac biomarkers cTnT and NT-ProBNP. Patients were assigned a score of 1 for each of the following: 1) dFLC ≥180 mg/L; 2) cTnT ≥0.025 ng/mL or, 3) NT-ProBNP ≥1800 pg/mL, to give stages I to IV (for 0 - 3 points, respectively). The staging system was derived from 810 patients with newly diagnosed AL amyloidosis and tested on two further populations (n=303 and n=103). The authors concluded that this revised Mayo staging system (based on sFLC measurements and cardiac biomarkers) allowed better discrimination of patient outcomes in AL amyloidosis than a staging system based on cardiac biomarkers alone, and should be incorporated into future clinical trials . Dittrich et al. confirmed the prognostic value of the revised Mayo staging system. Moreover, the prognostic value of the system was preserved in the subset of patients with reduced eGFR or atrial fibrillation, which are known to impair the reliability of cardiac biomarker measurements. This is unsurprising, because although both renal impairment and atrial fibrillation cause increased cardiac biomarker concentrations, they themselves are associated with inferior overall survival. Wassef et al. used the above staging system when comparing sFLC results produced by Freelite with another manufacturer's monoclonal antibody-based FLC assays. The quantitative results and stage allocation differed for the two immunoassays, indicating that the staging system cannot be extended to different assays without separate validation (Chapter 8).